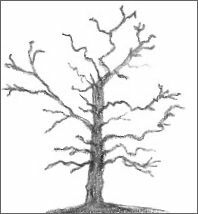 Creating tree drawings is an entertaining exercise because you have the opportunity to add your own touch as you interpret individual characteristics of a tree. This page shows my absolute beginner drawings which means they are definitely unique. At least, I can't imagine you'd find images like these anywhere else! 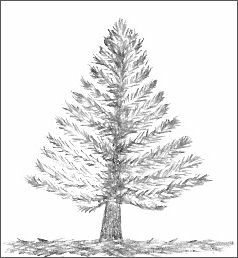 Below is my imitation of a cypress tree which is a needleleaf evergreen. This particular tree has been blown by the wind so constantly that it grew with the direction of the wind. I knew as soon as I saw the picture of this tree that I had to draw it. It's like a compulsion that an artist has to follow. Again, this was a drawing that I completed in about my first year so it's not one that you would study and learn from. 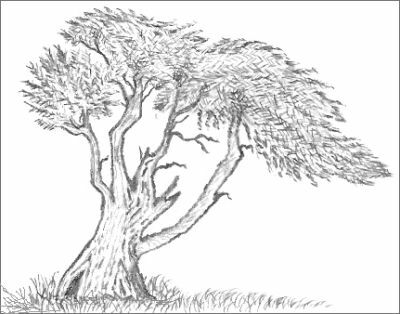 However, it is a simple tree drawing and one that you can easily copy to get a good image appearing on your paper! My favorite pencil of choice is a mechanical pencil and it's perfect for most subjects. I love observing trees, they just have so much style and there's such a wonderful variety. Actually, trees can teach us a lesson about weathering a storm, we only need to bend a little to accept change of any description. Trees are the largest of all plants and they are the oldest known living things. There are two main types of trees - Evergreen and Deciduous. Evergreens don't lose their leaves in autumn whereas the deciduous do. An evergreen tree retains some or all of its leaves throughout the year. This is a balsam fir, also a needleleaf evergreen. The ground underneath these firs is just littered with pine needles. Conifers are needleleaf trees such as pines, firs, hemlocks, redwood and spruces. Most conifers are evergreens. Evergreen trees are also known as softwood. Needleleaf forests grow mainly in regions that have long cold winters. Deciduous means temporary or tending to fall off. It is the word used to describe a tree that loses all its leaves at some time during the year. These leaves are flat. Broadleaf trees like elms, ashes, oaks, maples, willow, to name a few, are deciduous. They are known as hardwood. This drawing is of a common oak in the fall. Broadleaf forests grow in regions that have plentiful rainfall. To this day, I love drawing trees just like this one because it is a flexible subject. Only you know if you have made a mistake but the actual drawing is attractive, no matter what. The crown of the tree, which is above the ground, consists of the trunk, branches, twigs and leaves. The roots are below the ground and they are the fastest growing part of a tree. They support the tree and act like an anchor. The roots draw in water and the water then travels up to the trunk and to the leaves. Isn't Nature fascinating? When a tree is cut, a series of rings is obvious in the wood. Each ring represents one year of growth and you can count them to determine the age of the tree. So, for as long as a tree grows, it becomes thicker each year. 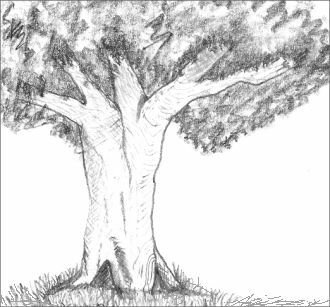 If you want to draw a tree quickly, there is the option to use the side of the pencil to portray foliage, as illustrated above. Drawing trees is quite a simple task, yet to an outsider the finished outcome looks as though they are complicated. Master artists tell us not to individually draw leaves when we depict a whole tree. The only time you add detail to a leaf is when you do a dedicated or close-up study. So, in the case of a tree some distance away, you only need to give the perception of leaves. The tree drawing on the right only took minutes to complete and I often sketch images just like this one as a form of doodling. Decide what type of tree you wish to draw and figure out the basic shape of that tree along with the shape of the foliage. Then you decide what sort of strokes to use to portray those leaves, for example, you use spiky strokes for Needleleaf trees. 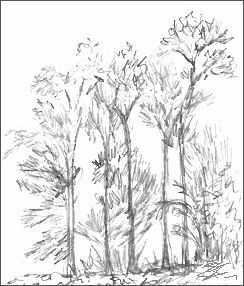 It only takes a series of scribbled lines to make a good grove of trees in a landscape drawing. The more you practice tree drawings, the easier it becomes so grab every opportunity that you can to draw! 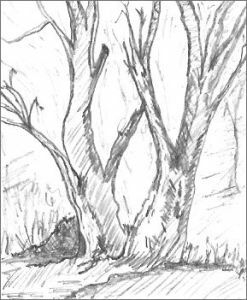 If you want more tips and advice, visit Ivan's website to see an easy step by step process for drawing different kinds of trees. I can see by looking at these old tree drawings that I know a lot more now than I did when I first started drawing. I can spot lots of errors but that's not the game I'm playing here, I just want to show you that anything is possible if you make an effort. These tree drawings were satisfying to me at the time of creation. Being new at the game, I made the decision not to show my work to anyone and that gave me the freedom to try a great variety of subjects. It's amazing because your state of mind determines whether you succeed or not. If you want to teach yourself to draw then it's up to you to make it happen. Anyone can learn to draw at any age. Remember, art should never be criticized because it comes from within. If you like it, well, that's the most important thing!